To make an easy statement and eliminate the need for a necklace, although chokers do accompany them excellently, put on a pair of tassel earrings! Popular due to their playful movement, an endless selection of tassel earring is right here, online, at your finger tips. Don’t know where to start? No worries, I’m going to break the trend down for you. When it comes to tassel earrings, the main styles include beaded, fanned, fringe, and mixed media. I purchased these in store at Target, they’re from the SugarFix by BaubleBar line. They add a brilliant pop of blue to my outfits and have been invaluable to my summer wardrobe. You can get them on sale here for $6.48. The New Friends Colony Beaded Tassel Earrings feature shimmering glass beads. The dominate bead color is black, with the incorporation of clear beads at the bottom of each strand of beads. For $46.00, you can add these to your collection of casual earring options. 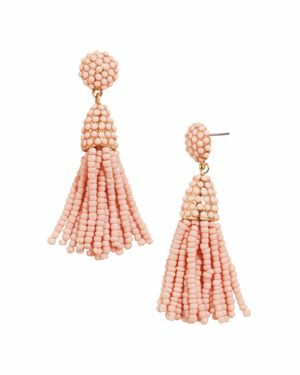 For a pair that is smaller and shorter, you must check out the Baublebar Mini PiÃ±ata Tassel Drop Earrings . Being about half the length of most tassel earrings, they’re perfect for making a slightly more subdued statement, while still giving you the movement of longer tassel earrings. The price isn’t too bad at $32.00 per pair. The Baublebar Antonella Tassel Fringe Earrings are colorful, face framing earrings. The pair shown above displays fringe made up of red, white, and blue string. I love this mixture of colors, but this particular pair is also available in several different solid colors. They are pricey at $48.00. I’ve gotten even more use out of these black fringe tassel earrings than I have the blue beaded tassel earrings that I mentioned above! The neutral, uniform black makes them a viable option for almost any outfit. I purchased these at Ambiance San Francisco, I can’t recall their cost, I want to say it was $12.00 to $15.00. The Nakamol Design Layered Tassel Statement Earrings , $35.00, tier 3 tones of calming blue. I really like the gradient of color in these earrings from dark to light, drawing attention to your beautiful face and down to your neck and shoulders. To combine modern and bohemian, take a look at these Bp. Oversize Fan Earrings . They’re only $19.00 and they feature the classic combination of black and gold. Short black tassels fan out of the golden semi-circles that are attached to gold posts. Suspending royal blue fringe from shimmering goldtone plates was an exquisite idea. In addition to the blue and gold combination pictured above, the Serefina Lunar Tassel Earrings are available in white and gold and pink and gold. The beauty of this pair is reflected in its price, they’re the most expensive on the list at $75.00. The Aztec Tassel Fan Earrings are fabulously fun! I love the mixture of different shades of blue, green, pink, orange, and red in these multi-colored fan earrings. With the inclusion of so many colors, you can really wear these with anything. Being more casual, I’d wear these during the day to add a pop of color to any outfit. This versatile pair of tassel earrings is only $18.00. Anchored by crystal and embellished by black seed beads, the Bp. Crystal & Tassel Earrings successfully combine hard and soft textures. These earrings would go great with cocktails, and for only $19.00 I can see them dressing up your favorite LBD! For a unique pair of tassel earrings, take a look at these Ink + Alloy Suede Tassel Drop Earrings . Topped off with 2 discs and a bead, the soft suede dangles down highlighting your neck and collarbone. These $71.00 tassel earrings are also available in light brown suede. 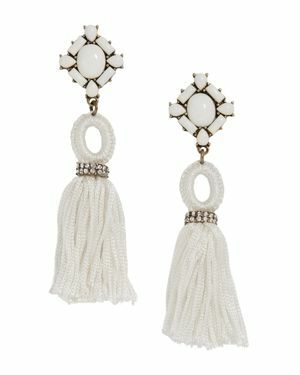 I love the combo of white acrylic beads, white rope, and clear crystals in these Baublebar Sohvi Tassel Drop Earrings . Each element complements the other creating an elegant tassel earring that can dress up or add chicness to any ensemble. The best part of these tassel earrings is that they’re only $36.00, they look a lot more expensive than that! Which of the above styles is your favorite? Love these I just bought a pair!! I feel like bright blue is trending this season as well lol!! Agreed! Which I’m totally cool with, I love bright blue!